I have sculpted the kneeling figure’s master converting one of my standing Redcoats, and fitted it with the same arms of my standing-and-firing figure. This same kneeling master also accepts the arms of the infantryman standing/advancing with musket at the level. All things considered, I got two useful new poses with very little effort, and the end result is quite satisfactory, I think. 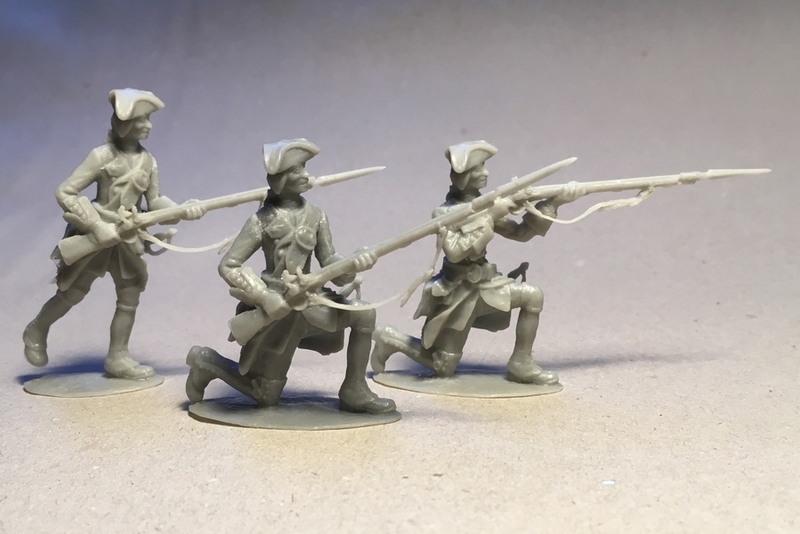 As I have mentioned in a previous post, I felt I needed a kneeling-and-firing pose to allow my well-trained British infantrymen to perform three-ranks volley fire by platoons or divisions. In order to do this, the men in the front rank would put the right knee on the ground, while the men in the center and rear ranks would take a step to the right so as not to interfere with their comrades in the preceding ranks. This was referred to as “interlocking the ranks”. In order to test that my firing figures could actually be deployed three-ranks deep, I placed them on cardboard bases of suitable sizes (3 x 3 cm for the standing figures, and 3 x 4.5 cm for the kneeling figure). I then off-set each rank half a base to the right of the preceding rank, and was satisfied that no figure interfered with the others. Alternatively, I aligned the first and rear rank figures, and off-set the center rank half a base to the left. This is how three-ranks volley firing is depicted in French arm drill manuals of the 1750s.